The older I get, the less sure of myself I become. Certainty, it seems, diminishes with age. Hopefully, that’s part of the “wisdom of the aging brain” as Nautilus described it. This week, at Business of Software Europe, I was asked to give a talk on this topic, and created a short, visual set of slides. 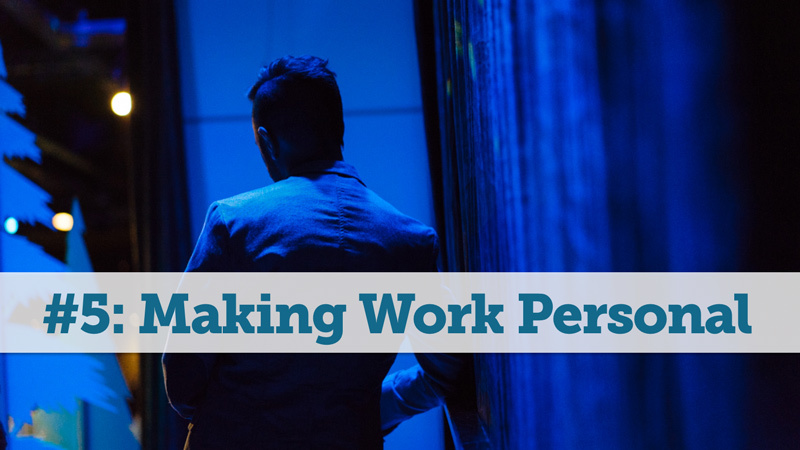 Typically, I put those on my Slideshare and have enough detail in them to be useful, but this presentation is an exception and, as such, I’ve instead opted to turn the talk into a blog post. First — some critical caveats. This topic, more so than most others I share, is very specific to a point in time (May, 2016). I often revisit questions like these while tossing and turning in bed or on my daily walks from home to the office and back. Every few months, one or a few of my opinions on these issues change as I have more data, more experience, more input from across the industry, and (hopefully) greater perspective. That said, I believe it’s a worthy exercise to regularly re-evaluate. The world of software and marketing tech move insanely fast, and holding a 2010 or even 2015 mindset in 2016 is likely dangerous (e.g. Tomas Tunguz’s recent analysis of SaaS valuation predictors, which upended some formerly long-held beliefs about the market). I broke my presentation into three sections. The first — What I’d Change — looks at mistakes, regrets, and issues on which my thinking has evolved. 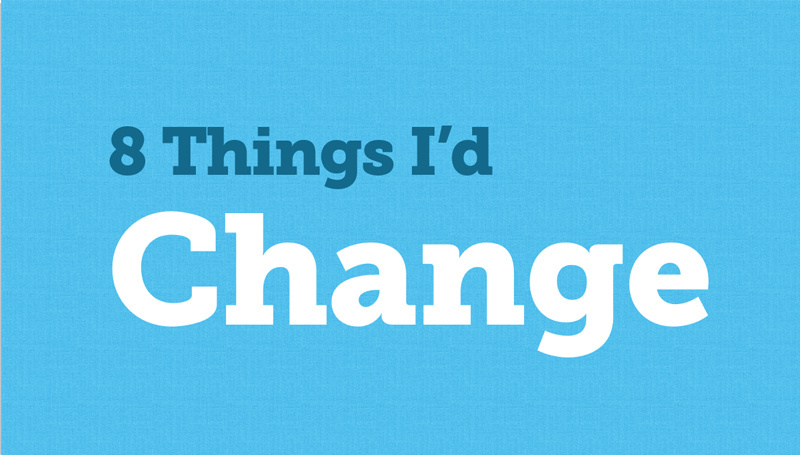 The best way I’ve found to think about changes from the past is to examine my regrets. One of the biggest I’ve had over the last 10 years of Moz’s evolution in the software field is around my inability to have context for the core of the work that produces our products. If I had college or my early career to do over again, I’d learn software engineering. This is not about taking a few courses in Ruby or Python, but about understanding the fundamentals at the core of building software end-to-end. It’s the kind of learning you can’t do in “just a few weeks” or through purely online courses or a boot camp. What I regret, and what I wish I could re-do is the type of learning that takes years. It’s what many engineers I’ve hired and worked with did in their high school and college years, both formally and informally, and the skills they honed in the first few years of their career. My ability to hire well, especially early in Moz’s transition to software — when we did find great candidates and bring them on board, it was often through coicidence, because I did not know the right questions to ask, the right ways to review work, or the right processes and decisions to approve vs. reject. My ability to know what was reasonable for an engineer to accomplish in a given period of time. As a result, we’ve been adversely affected by both gross underestimation and sandbagging. My gut sense for how to structure an engineering team, whom to hire to manage that team, and how to hold those people responsible. How to interview software engineers, how long it should take to ramp up, how many people was right for a project, and who. My sense for A) whether an engineer is performing well or poorly, B) whether problems we encounter in our software are because no reasonable engineering team could have predicted them or because we have poor processes or the wrong people C) whether issues we face are the responsibility of the engineers, the dev managers, the execs they report to, the execution plan, or the product design. I think I hate the not knowing most of all. There’s virtually no other practice at Moz I haven’t personally done the work on at some point – finance, HR, customer service, onboarding, marketing, product design, office management, people management, UI and UX design, data analysis, research, etc. At some point in Moz’s history, I spent months if not years directly responsible for and/or doing that work. But, while I wrote a few simple websites in PHP in my very early years, I’ve never had a true, in-depth understanding of the end-to-end work required for large-scale, highly-functional, redudant, scalable, top quality software. 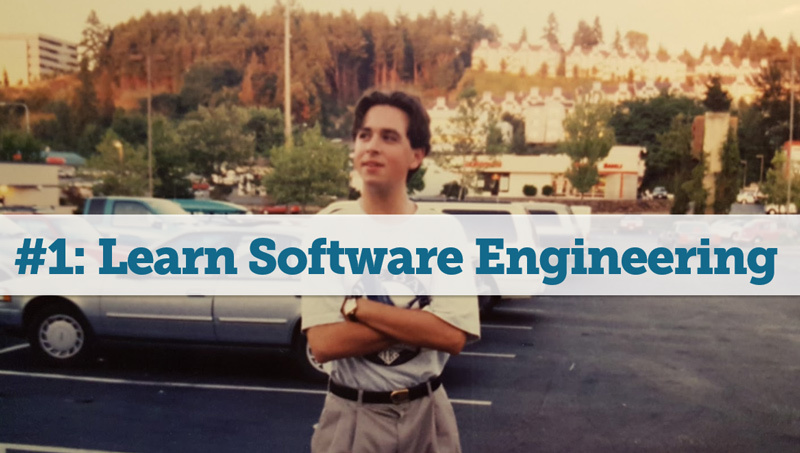 My advice to my younger self – don’t just learn to code; go become an engineer before trying to build an engineering-reliant and centric company. Similarly, one of my frustrating experiences over the last 15 years has been that every time we try to tackle a new process, we have to learn it for the first time. My co-founder, Gillian, hadn’t ever worked in another startup/tech-company, and of our early executive team at Moz, only Adam Feldstein had been at any other tech company (Microsoft). It’s not just the learning curve, but the experience path itself. Each time we undertake a new practice – building out an HR function or trying to hire a CTO or figuring out acquisitions or enterprise sales or anything, there’s a period of discussion, a process whereby we try to learn what other companies are doing or have done, time we take to experiment, and then, eventually, we learn what we like and hate. I strongly suspect much of that (at least, under my tenure as CEO) could have been faster and less rocky had I any prior experience. It’s not just the processes, though. There’s also an aspect of fear and emotional resilience that comes from being through something in the past. Brad Feld was always a great role model for this. We’d talk at a board meeting or over dinner about something that was driving us crazy and keeping us up nights and Brad would say “Oh yeah. I’ve been through this many times with many companies. Don’t worry; it’ll pass. Here’s the usual cycle we see.” I want that template! I want to have seen and experienced that cycle even just once before. Going through a startup this time has made me realize why investors love entrepreneurs who’ve been through it before (even if it wasn’t their company last time). The wounds you endure heal. They become scars. And you become more careful about how to avoid that injury, more immune to that particular pain, and more resilient to the anguish. Today, when you sign up for a Moz subscription, we leave you mostly alone. 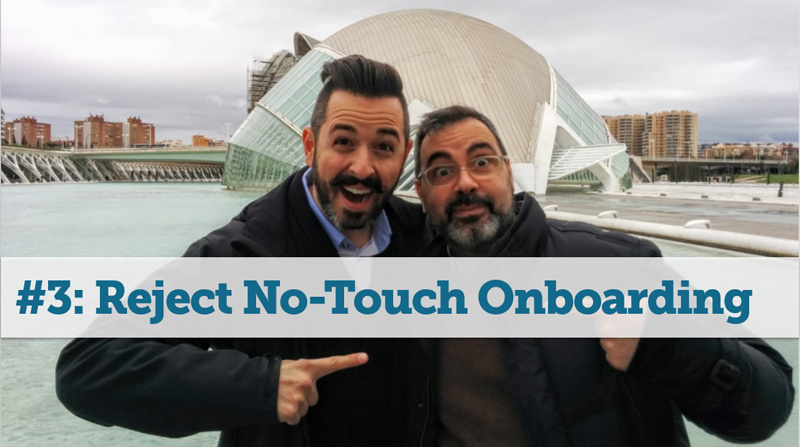 Sure, there’s a few onboarding emails, but you’re not assigned any personal contact with a live human being who takes you under their wing and is responsible for you happiness and understanding and usage of the product. I think that’s probably a mistake (and one we’re slowly testing with a new customer success team). From my discussions with dozens of other founders in the SaaS field, that seems to be a crazy move on our part. Sure, it’s a lot less expensive, but cost shouldn’t be the issue, especially when retention is the greatest predictor of success in our field (not even gross margins trump that). If I were doing Moz over again, I’d assign a smart, well-trained, experienced SEO to onboard every customer, and be their personal assistant with the product. Next time I do a SaaS business (and hopefully, I’ll someday have that chance), it’s going to be high on my list. Brad and Michelle are amazing. They always treated me with respect, with empathy, with genuine affection, and never judged me or were unfair with me or did anything to dampen my spirits or my resolve at Moz. From talking to other founders who’ve raised money, I’ve discovered that’s damned rare. Most CEOs struggle with their investors, have a few knock-down-drag-out fights at board meetings, find themselves strongly disagreeing, and have days when they wish they’d never raised money from those people. I don’t want that experience, but I do wish Michelle and Brad had been harder on me, especially when, as I perceive, they both felt I was making some boneheaded moves in the late 2012 to early 2014 era of Moz. It may sound odd, but I’m not wishing for more conflict, just a little less hands-off/let-him-figure-this-out approach and more just-tell-me-what-I’m-doing-wrong. I don’t know for sure if I would have listened, but even if there was a small chance, I’d have taken it. Too many times over Moz’s history, we’ve launched an MVP with a big focus on the “Minimum.” I think that works OK in a very early stage company and in a market where there aren’t many existing competitors with similar features and functionality that your audience is already using. When that is the case, and you’re fighting an uphill battle against entrenched providers of similar software, it’s been my experience that you need to be multiple times better to meet that minimum bar. In fact, I’d say “minimum” is entirely the wrong word to use — it should be “exceptional,” instead. More Startups Die of Indigestion Than Starvation. Focus Wins. Doing too many things fails. If I could go back in time, I’d hire fewer people, build fewer things, and focus on being the best in the world at just 2 or 3 of the 10+ major features we tried to tackle in Moz’s Pro product. From that position of strength, I’d be tempted to go after one more at a time, but slowly! In our field, just retaining the leadership position in a market and with a tool function is difficult enough that anything else would be (and has been) overreaching. For the first few years after Moz’s 2007 funding ($1mm from Ignition Partners and $100K from Curious Office), we were extremely conservative with our spending, particularly on hiring. In hindsight, I think that was a mistake. I should have pushed us to hire fewer people, spend less on a smaller office space, focus more (as above), and use the extra dollars on folks who we, at the time, considered “out of our range.” Watching what 90%+ percentile pay execs and engineers can do and, equally importantly, what they’ve seen before and can help us avoid, has humbled me. 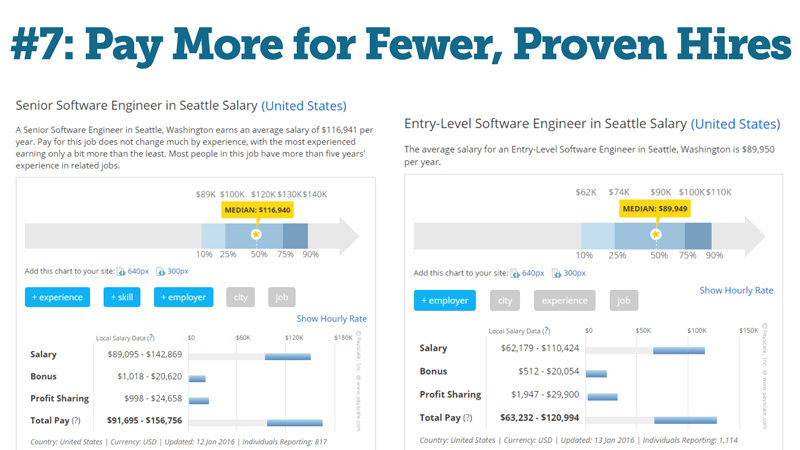 Next startup, I’m hiring less, and paying more. BTW – today, it’s a different story. For one, we do pay considerably higher in general than in those early days. For another, we have a cadre of smart, senior, experienced folks who can help onboard and upgrade the skills and knowledge of more junior employees, and in fact, one of the ways we’ve improved diversity and upgraded our team has been to hire some less experienced by clearly talented team members and give them time and direction to move up. 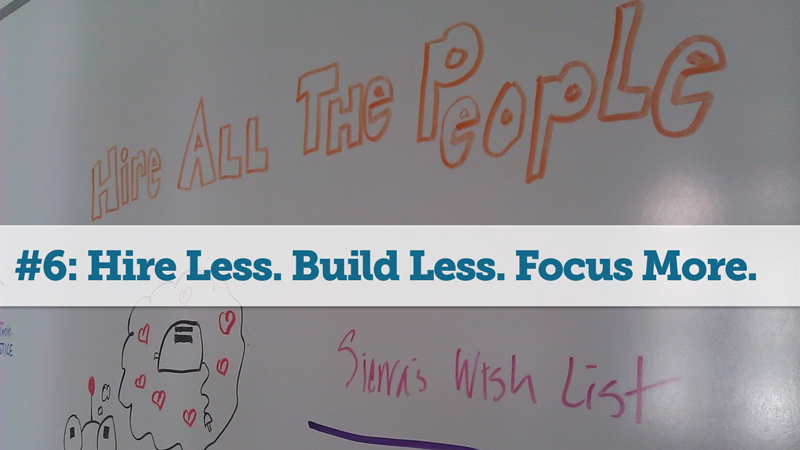 I like this approach a lot when you’re at 75+ employees, but when you’re 5-10 people, it’s very hard to make it work. In 2011, I had an offer to sell Moz — the only serious one we’ve ever had. I plan to write more about this in my upcoming book, but basically, I was greedy, overconfident, and felt the price wasn’t high enough, so I walked away from what would have been a terrific match and a terrific payout. Geraldine and I owned almost 35% of the company at the time vs. the ~18% we have now (after rounds of funding and option pool expansion). Chances are good that, even if Moz has a phenomenal exit, it won’t make up for that dilution and, financially, I will have made a poor decision. And then, there’s the worst part – the fear that, even as Moz is a $40mm+ revenue company with a great team in a huge space with a big opportunity, we could completely blow it, and I’ll have nothing to show either stock-value-wise or from a sense-of-self-accomplishment perspective. There’s an odd dichotomy in the entrepreneurial world – succcessful entrepreneurs (those who’ve built and sold/exited/gone public with a business) and aspiring entrepreneurs (those who haven’t). Even a tiny exit that only makes you a little bit is a badge of honor and pride. It elevates you in status and resolve and mental toughness and emotional fulfillment. I’ve seen it so many times in entrepreneurs I meet, and I so poignantly feel that desire to just have what they have – “one under my belt.” Yeah – it’s jealousy and avarice and all the worst traits capitalism breeds, but that doesn’t mean it doesn’t have a regular impact on my psyche. 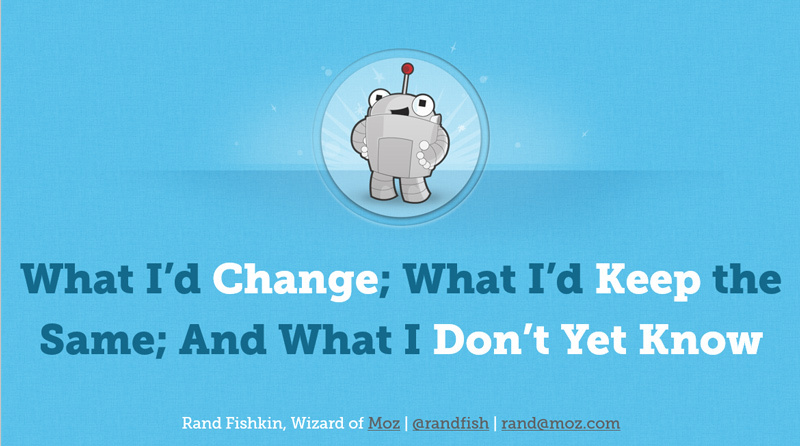 Along with the changes, I spent some time discussing what I and Moz did right. I’m a pretty harsh self-critic, but even I have a handful of things for which I’m deeply grateful and would repeat again in my next company. 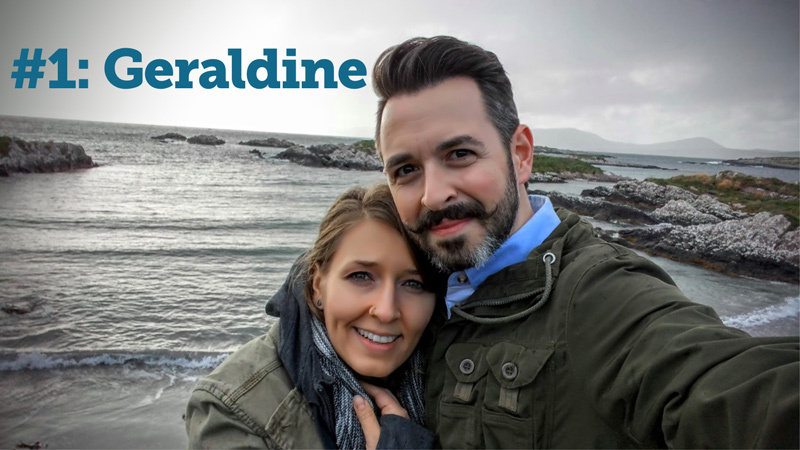 It’s no secret that I’ve made my wife, Geraldine, a huge part of my personal, professional, and public persona. Geraldine’s never been an employee of Moz, but she was instrumental in its formation. For years when we were deeply in debt and I was bringing home miniscule or non-existant paychecks, Geraldine paid our rent, our bills, and for all our dates and social activities without complaint. 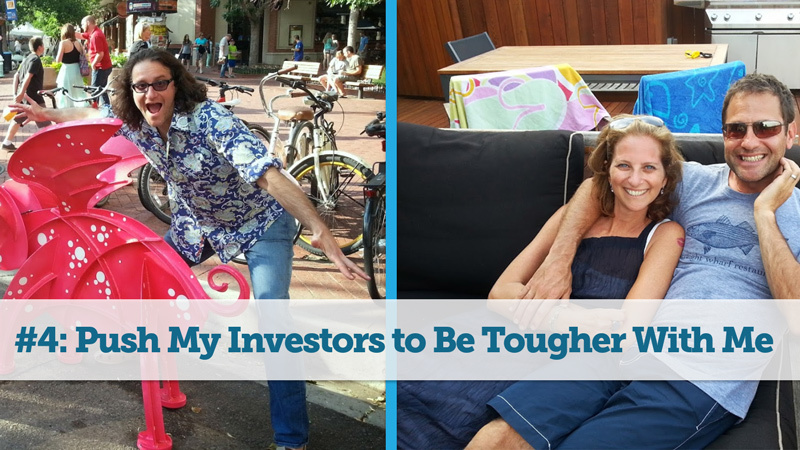 She was, in a very real sense, Moz’s first investor. But she’s been more than that. Geraldine was the initial author of the TAGFEE code. She took all the feedback and mish-mashed ideas that we had collected about core values in 2009 and turned them into a document and an ethical architecture that’s guided us as a company and me as an individual. It was her deep understanding of, empathy for, and, I think, love for me that drove her to create TAGFEE as she did. She knew the hatred I harbored for secrecy and mistrust (hence, Transparency), the irrational value I placed on standing out from the crowd and being different (hence, the Exception), how I cared deeply for people (hence, Empathy) and felt that work need only be work if we make it so (hence, Fun), the way I abhored the false masks people often felt compelled to put on for their work (hence, Authenticity), and my desire to give back to our team, our community, and our customers (hence, Generosity). In this way, she turned our core values into a documented manifestation of who I was, what I cared about, who I’d hired, and the beliefs we shared. TAGFEE has been a hugely helpful asset to every part of Moz. 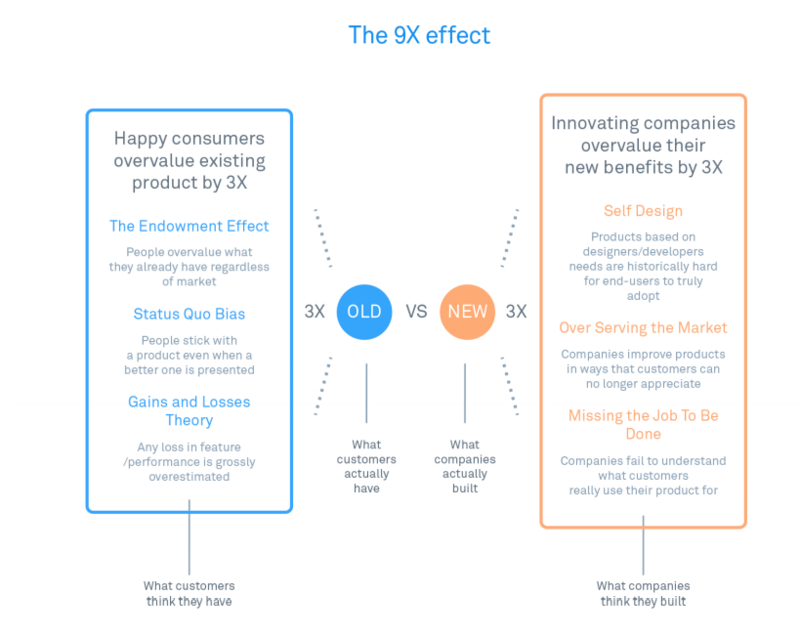 It was something we desperately needed in our early days, but didn’t know to create, and ever since it’s existed (2009), it’s felt like a massive boon to the company’s ability to hire and retain people, structure our decision-making, build up our marketing efforts, and even design our products. I’ve written in the past about how these values are like a roadmap for how we consider options via the vision-based framework, and that’s continued to hold true. TAGFEE has also become a big part of who I am personally, and I strongly suspect that, for the rest of my life, it will be how I define myself, measure my judgement, and hold myself to account. Would endorse 1,000X. One of my proudest accomplishments at Moz was the creation of a dual-track system for employee advancement that didn’t require management to be the only way up. In fact, when I stepped down from my role as CEO, I took on an individual-contributor role myself, and as we’ve brought on hugely talented folks like Russ Jones, Dr. Pete Meyers, or Christine Ryu (who designed the UI and UX of the Keyword Explorer tool), it’s been critical to have a path for advancement in salary, stock options, and influence that doesn’t require people management. 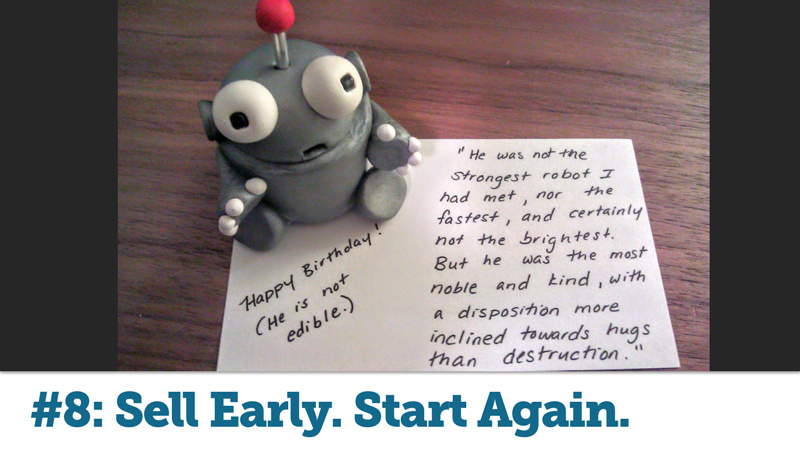 Before we ever built a product or had a suite of tools anyone could subscribe to, Moz built an audience. This was an unintentional move, but it proved to work brilliantly. We already had a core group of potential customers (who’d known and supported us as a content resource for years) before we ever offered a product. This is a strategy I’d replicate again, far more intentionally, with any future venture. The greatest advantage initially seems like it’s the low cost of marketing you’ve generated by having a stready stream of people who already care about the problem you’re trying to solve visiting your site, knowing you, liking you, and trusting you. No doubt about it — this is hugely useful. But, even more valuable is the deep experience you gain from spending so much time trying to provide value to and earn attention and amplification from the crowd you eventually want to serve. Those years I spent blogging and filming and participating in forums and having phone calls and helping out with questions are a big part of how I knew what SEOs wanted in a software tool, and Moz’s early growth rate, despite zero paid advertising, supports that theory. The photo above was taken during CEO Swap, a very unusual exercise that Wil Reynolds and I undertook to learn more about each others’ professional lives and companies. While this might have been the most obvious, press-attentention-getting move around the idea of living in our customers’ shoes, I think it still serves as a great model for how to gain real empathy for the pains and needs of your business’ customers. 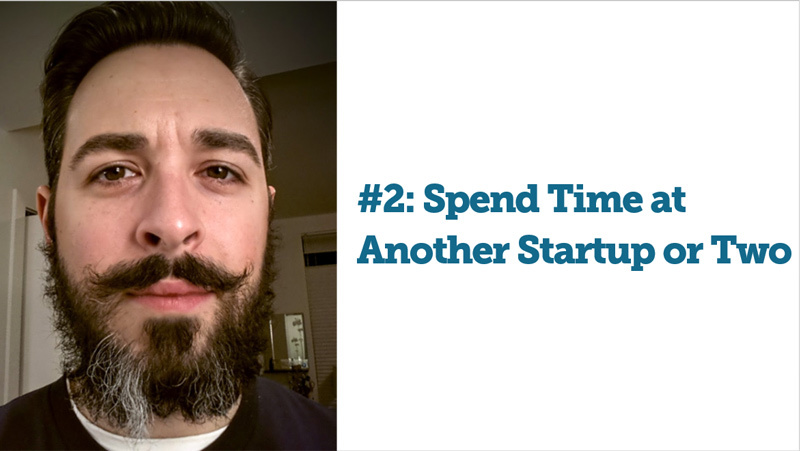 Market research, customer interviews, usability tests, surveys — these are all fine tools, but in my experience none of them compare to forcing yourself to make money and do the work the same way your customers do. Thankfully, Moz’s first life was as a consulting business, and so I keenly felt the same pain our customers did for our first 3 years of life as a software company (2007, 2008, and 2009). It might just be correlation, and not causal, but I suspect there’s a connection between that lived pain and the resonance our early products had in the field, and possibly a thread between the disconnect of the product I designed in 2011/2012 and what our audience actually needed then. 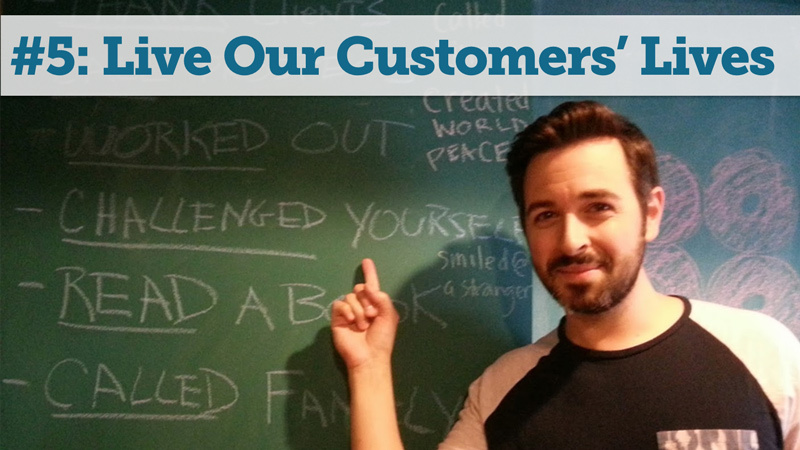 Lesson learned – be the customer you want to serve. If I were to do another business (and hopefully, someday, I’ll have the freedom and flexibility to do so), I hope to avoid raising institutional money. If I’m truly lucky with Moz, I’ll hopefully be able to bootstrap and self-fund. If not, I’d likely look to angel investors who are comfortable with lower rates of return on higher-survival-rate, less growth-at-all-costs businesses. The challenge with institutional investors (VCs, Private Equity, Growth Capital providers, etc) is how their portfolios and math work. A VC may place 10 bets on companies, expecting 4-5 to fail, 3-4 to break even or make a little money, and 1 or 2 to become breakout successes that essentially pay for the entire portfolio and return those big numbers to the fund that make them look good to their LPs (Limited Partners – the folks who invest in the VC funds). As a result, the behavior VCs generally need to encourage is growth at any cost. If a company burns out trying to become that 100X star in the portfolio, it’s OK. But if they choose to grow slow and steady and build a sustainable but not particularly dominant business over 10-15 years, that’s non-ideal for the portfolio or the fund’s returns. To be clear – Moz’s investors (Brad & Michelle) have been very hands off when it comes to pushing us for faster/harder growth. So much so that one of my points above is that I wish they’d been a little tougher on me. But regardless of their behavior, support, and empathy, we all know what the focus is, and we all feel the immense pressure to get growth rate higher. Moz didn’t have the freedom to be patient, double-down on our SEO product, focus on making it great, and take a year or two not worrying about the growth rate. Instead, we had to find alternative sources of revenue and product lines that could grow fast (like Moz Local) and make bets on more experimental ones, too (Moz Content, FollowerWonk, the API, etc). I don’t know that slowing down and focusing would have been the right or best thing for the business. I know it’s what I wish we could do, but our model and our committments are such that it didn’t make the cut for potential plans of action. I’m really glad I got to be part of a VC-backed business. I don’t think I’d have learned nearly as much anywhere else. If I’d stuck to a bootstrapped business, I’d always wonder if the grass was greener, always be jealous of the press and the glory that comes from announcing a big funding round, always wonder what might have been. Now, I’m ready to try the other side. Another accidentally smart move we made, that I’d repeat in the future, was the choice of a field that was generally ignored if not actively reviled by many other tech and startup entrepreneurs (and investors). The market for SEO software is massive, growing, and surprisingly uncrowded compared to others of its size and structure, but because of SEO’s historically ugly reputation, especially among engineers and investors, it remains a space with relatively few VC-backed companies, and almost none in the self-service/non-enterprise space (Moz is, to my knowledge, the best funded of these at $29.1mm invested). 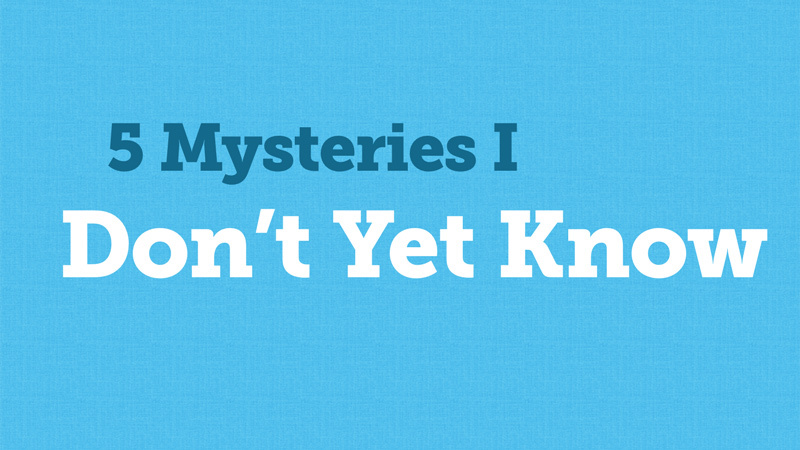 The process of identifying unknowns was, perhaps, the most interesting one out of these three. I spent a good deal of time noodling on big picture items that could go different ways as the future unfolds. I think all of these will be important to figure out and hopefully I can do so before they adversely affect the company and before I have a chance to do my next venture. From 2007-2014, Moz had only a single product – our suite of SEO tools and software. Single-product companies make marketing easy, they make building a funnel easy, they make website design and SEO and content strategy and team structures and reporting and finances and a million other pieces of the business easier. For years, Moz benefitted from this singular focus, but I don’t think I realized quite how remarkable and friction-free it made so many aspects of the company’s growth. That said, a single product, particularly one reliant on external forces (like the continued use of web search, onoing needs for website SEO, etc), carries with it some risk. I think it’s extremely unlikely that, in the next 5 years, SEO will change dramatically enough to threaten Moz’s business (or others in our space like SEMRush, Majestic, Ahrefs, or Searchmetrics). But 10 years? 15? 20? Maybe there is real risk there. And thus, as Moz’s only likely path to exit became an IPO, a more diverse product lineup made sense. We first experimented with local listings optimization via Moz Local with the acquisition of David Mihm and GetListed, but then expanded to Moz Content, and broke out FollowerWonk as its own product, and have put more serious energy and people toward a separate API business, too. We’ve talked about others as well – expanding Wonk to be a full-fledged, “Moz Social,” type of business, thinking about whether we might build a separate keyword and rankings data arm, even toying with the idea of enterprise SEO (possibly through partnership or acquisition). But all of this comes at a high price. Building out multiple products means that “Moz” doesn’t just equal “SEO software” anymore, and that’s tough from a branding and recall and human association perspective. It’s way, WAY harder to manage multiple products from a marketing and conversion perspective. It’s also extremely tough to manage the relationship between enterprise-style sales (which Moz Local, for the first time, has) and our classic self-service/content-marketing-focused funnel. Believe me – it’s very, very not fun to go through the pain of meshing enterprise sales needs and culture with what Moz has, historically, been great at. More than a few of our folks internally are struggling mightily with this conflict, and I suspect the same is true externally, as folks in our community and extended audience attempt to understand what Moz really is. I think the next couple years will tell me whether if, in a future company, I’d consider multiple products again, or be happier living with the single product risks and benefits. 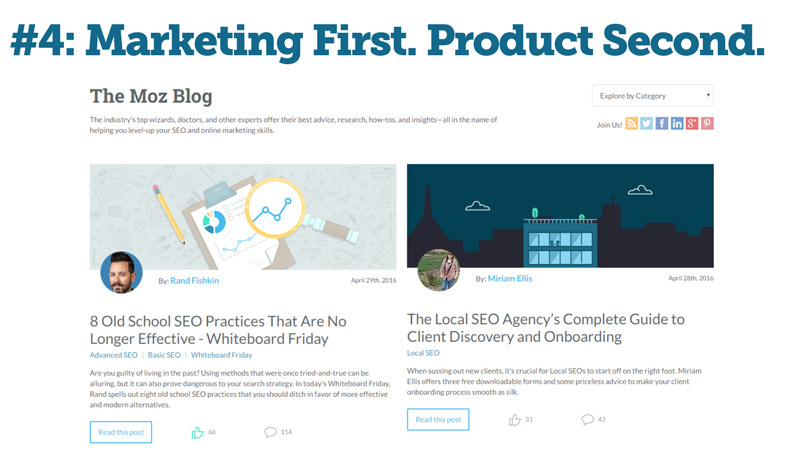 The first few big products Moz built and launched – Open Site Explorer, the old “SEOmoz Pro” suite, the Mozbar, etc. were all designed (at least, at the high level) by me. I thought I was getting better and better at that product design process over time, until Moz Analytics. The failure I felt from that product runs deep. I regret nearly every aspect of it – the product strategy, the engineering process and practices, the way I managed it (or, in many cases, didn’t), the waterfall vs. iterative-launch methodology – everything. Recently, I had my first opportunity in several years to run an end-to-end product process at Moz – for Keyword Explorer (which launched in early May). I’m really proud of that tool. It’s the first one since Moz Analytics that I feel like we nailed. But… my opinion doesn’t mean much if the product doesn’t have great success, and that’s going to be driven by the metrics and the data. If KW Explorer gets lots of use, has a positive impact on retention, inspires more marketers to sign up for Moz or for the standalone packages, I’ll probably get the opportunity to design and build more products at Moz. My internal influence and respect might climb up a little (after some precipitous, but fair declines following 2013’s debacle). I’ve got a lot of pride and career satisfaction riding on this thing, and it’s nerve-wracking for sure. Obviously, I’d love to be a great product person. But above that, even, is the knowledge of whether I am. I mentioned above that Moz Local is our first product that’s using more of an enterprise sales model. That’s going to be a really interesting learning experience for me and for Moz, too. My personal bias is to despise sales. I’ve always hated the process of selling and the conflicts between sales and other aspects of a business that I’ve observed and heard about from so many other startup founders and CEOs (e.g. engineering vs. sales, marketing vs. sales, customer service vs. sales). Inherently, I get it. It’s tough to reconcile the competing demands of salespeople whose compensation depends on closing deals vs. other teams and people who are generally compensated on the quality, output, and consistency of their work as well as how well they work with others and uphold cultural values. But, if Moz can pull off this very challenging journey to make sales work in a TAGFEE way, I’m going to have an incredibly valuable role model and roadmap for the future. And sales has a HUGE advantage over self-service in the SaaS world – namely, that churn tends to be extremely low in enterprise sales-driven businesses vs. self-service. Just look at the comparison of SaaS Benchmarks from Nathan Latka’s list (the source of the screenshot slide above). The companies with an enterprise model have massively lower churn (some even have the vaunted, negative-revenue-churn) than those with self-service models. Moz has, technically, done 6 (5.9?) acquisitions in its history. Chas Williams’ project that became what is today, Fresh Web Explorer, was first, followed by Followerwonk, Audience Wise, GetListed, SERPscape, and another almost-completed acquisition that I can’t talk about publicly yet. 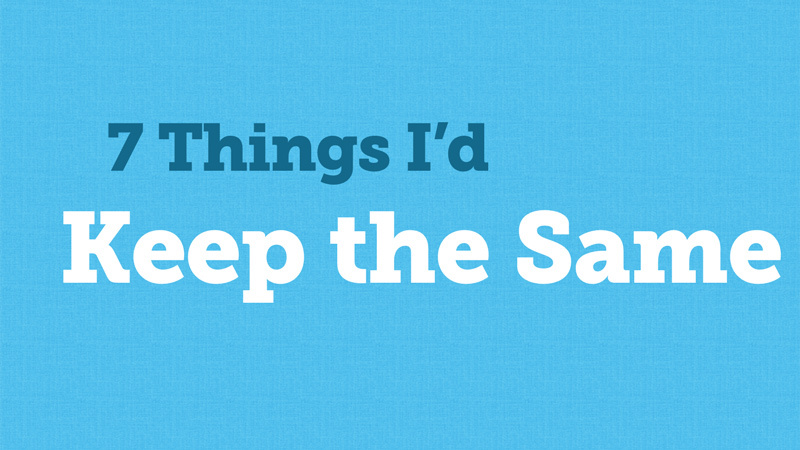 We’ve learned from each of those, and I have things I’d change and keep the same across them. But I sense that, in the next few years, we’re going to have a much better understanding of how they contributed (or didn’t) to Moz overall. 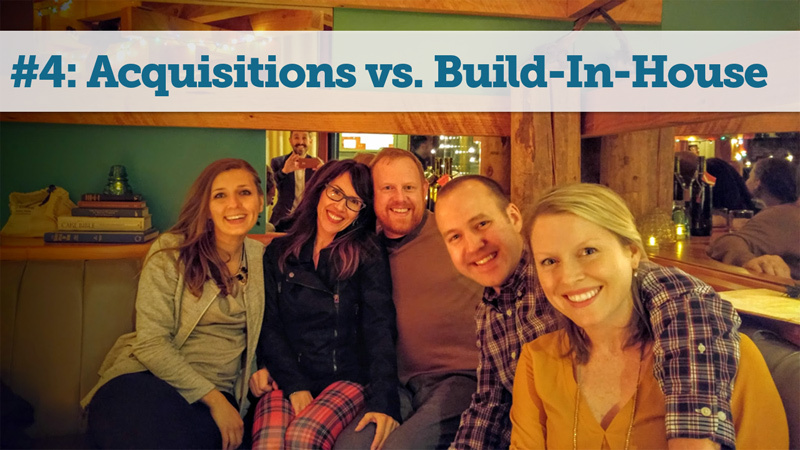 There’s also a small handful of acquisitions we didn’t do. One of those, in particular, I tremendously regret already. The others are less certain, although I think I’m mostly glad we didn’t. Even if some had been good matches, our greatest risks and challenges have come from indigestion, not starvation, and I’m mostly grateful we didn’t have any more. Moz is my life. Personally. Porfessionally. Emotionally. Identity-wise. Moz, along with Geraldine, defines nearly the whole of my identity. I don’t really have hobbies or activities outside of those two. We’ve chosen not to have children, and a big part of that is so I can focus this overwhelming amount of time and thought and emotional energy on the company. I don’t generally think of Moz as a sacrifice, because it’s a been a very priviliged choice I’ve had the luxury of making. But in terms of not doing other things in my life, Moz is the primary driver. I think that’s OK, but long term, I kinda, just a little, want to experiment with a broader set of life experiences. Is my historic level of investment and obsession with Moz the right (or only) way to build a startup? Is it even wise? Does the connection I’ve made between my self and Moz the company smart, because it helps build a personal relationship between people and the brand? Or is it foolish because it makes it harder for me to build an identity outside the company, and restricts the brand’s growth and scalability because it’s tied to a person? I think I’m going to have an answer to some of those questions in years ahead, particularly as we get further away from my time as CEO. Before I stepped off stage at BoS, I told Mark Littlewood (BoS’ organizer) how thankful I was that he asked me to build this presentation. The experience of asking these questions, and pushing to dig deep to find answers, and to find questions I still had, was incredibly valuable. I urged all the entrepreneurs and attendees at the event to go through the process themselves, and if you’re reading this post, I’d urge you to do the same. Self-awareness is a superpower.